The new Verna is based Hyundai’s Fluidic Sculpture 2.0, as a result of which the car features a sharp design with an array of curves and creases to mimic the flow of water. Does it look good? It certainly does and is a massive improvement over the older model. The cascade grille upfront gives the car a dynamic look and the sleek wraparound headlamps with LED DRLs and projector lights lend the Verna a modern and sporty appeal. The sharp creases in the lower part of the bumper along with tastefully done chrome surround for the fog lamp accentuate its sporty character. The side profile is my personal favourite to view the car as it gets a coupe-like design, wherein the roofline tapers neatly til the boot lid. The alloy wheels look like propellers and add to the sportiness of the overall design. The rear continues to feature the same sleek design as on the front and side with sleek and angular LED tail lamps, which look pretty cool at night.Overall, the Verna undoubtedly looks like a baby Elantra and that’s a good thing. The car looks premium and exudes a lot of kinetic energy, which will appeal to many young buyers. So what do all of these changes do the new Verna? They clearly make it the best-looking car in its segment right now. 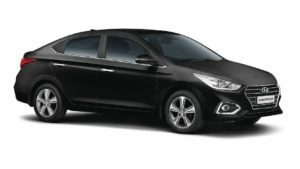 The old Verna faced quite a flak for its loose dynamics, and as a countermeasure, the new Verna is based on the K2 platform with a new front and rear suspension setup. The new underpinning makes the Verna behave well around corners as the chassis largely remains flat, with slight body roll when you push it hard. The braking is linear, but the brake pedal is slightly on the firmer side.Just like the brake pedal, the Verna’s suspension is also more on the firmer side, does a good job in absorbing road uncertainties. While the ride was never an issue with the Verna, it was high-speed stability. And the firmer suspension setup, together with the new platform, has managed to iron out the issue. Importantly, the steering is now quite direct and communicative.